I grew up in a very conservative subculture of an already conservative homeschool culture, in a pretty conservative stream of the Christian faith. Though I learned much from these experiences and am grateful for them, they laid the foundation for spiritual manipulation later in life. The Manipulators used words and phrases that I had heard before. They seemed biblical and very right, but they were not. I had been groomed for this. My family of origin was very loving, but that did not prevent me from absorbing patterns of interaction that left me wide open to spiritual manipulation. A foundation had been laid that gave the Manipulators their tools—tools that inflicted deep pain. Tools that I’m just now beginning to recognize. My hope is that this article will expose these tools and show how manipulators wield them. Many spiritual manipulators follow a pattern. They use the same key words, the same accusations, the same tactics. Their weapons can leave the Target breathless, alone, and without recourse. There is no safe place to hide. If you’ve ever been targeted, you’ll know the pain and confusion these four tools can inflict. 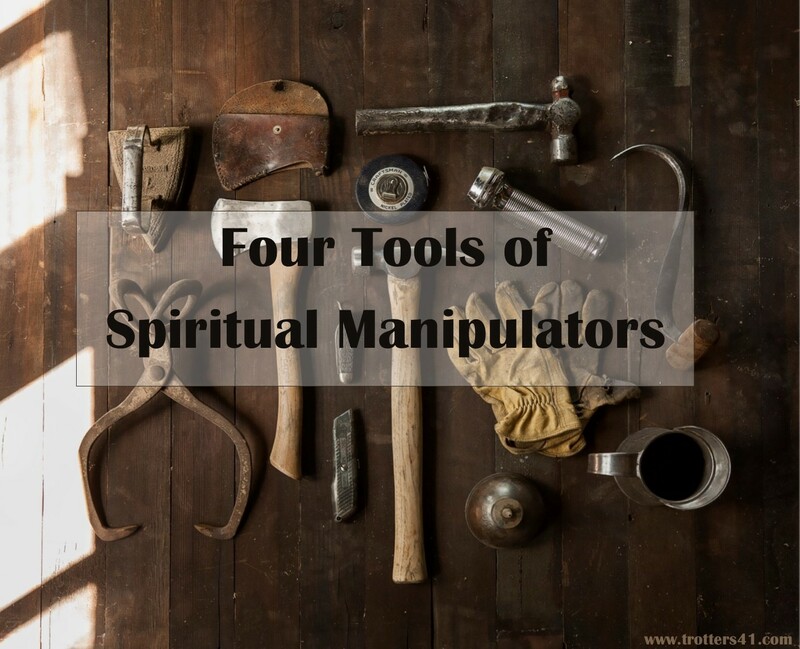 In brief, spiritual manipulators tend to use four tools: they accuse the Target of disrespect, gossip, pride, and having a “blind spot.” Manipulators love using these four accusations, regardless of their truth. They are easy to drop on people, and usually the purpose is not to bring the Target back to Jesus, but to manipulate the Target and/or protect the Manipulator. If you are accused of these things, examine the accusations carefully. Seek God’s counsel and the wisdom of trusted friends. It took years for me to recover from some of these accusations, and that only happened after many mature church leaders and friends (and a good therapist) countered and defused them. Be very, very careful when you hear the word “respect” being thrown around, especially in conflict. In controlling religious circles, it is a magical tool used to shut people up. It is often used by Manipulators to protect those in power, believing that if everyone would just be quiet and “respectful,” it would all be okay. But the trouble is, the minute you have to start demanding respect, you’ve lost it. Yes, of course, we are told to respect those in authority, the government, church leaders, etc. However, that truth is not a prohibition on kindly disagreeing and respectfully bringing up things you see as inconsistencies or flaws. If you’re accused of disrespect, check your motives, check with some trusted counselors outside the situation, and watch out for Tool #2. Manipulators will use a w i d e definition of gossip—and apply it liberally. They love labeling any negative talk “gossip,” even if it’s not. They will preach about it, talk about it, and elevate the sin of gossip to the level of blasphemy. By labeling all talk of this sort “gossip,” they magically remove their own responsibility to deal with the truth. Be aware that despite all the preaching and teaching on gossip, a concrete definition will be absent. For example, if reporting a possible crime to the authorities is “gossip,” it’s time to re-examine the definitions. I heard some really bad stuff about a person once, so I went to the person directly and asked if it were true. Their incredulous response: “You’re asking me to verify gossip? !” Well, I guess, but that’s not gossip. I wasn’t spreading false information, and I wasn’t lying about anyone; I was simply going to the person who was the object of the gossip and asking about some things that very much pertained to my life. I thought that’s what I was supposed to do. However, the Manipulator accused me of gossiping. When being accused of gossip, don’t be surprised if the Manipulator also blames you for “taking up another’s offense.” Feel free to remind him, respectfully, that sometimes the Bible actually commands us to take up another’s offense, especially when the other person is powerless to defend him or herself. If you’re accused of gossip, review the Biblical definition, check your heart, and watch out for Tool #3. If the first two tools don’t work, manipulators will often accuse the Target of pride. Manipulators seem to love the blanket accusation of pride. If the Target disagrees or has her own opinion (of events or ideas), she is arrogant and prideful. A more humble person would see the correctness and rightness of the Manipulator. This type of accusation puts the Target in an awkward position. The Target can’t really argue back, because that just reinforces the Manipulator’s point. The Target is left with no alternative but to accept this accusation, and thus this is a very useful tool for manipulators. Furthermore, since we are taught from a very early age that pride is one of the worst sins ever, this accusation carries a lot of weight. We know it’s serious business. This accusation in particular rocked my world. I now realize that it was not made in good faith. It was not made to help me get closer to Jesus; the accusation was made to control me—to control my behavior. And control me it did. For years, I questioned everything I did, everything I said. “Am I being prideful? Does this look arrogant?” It was a life without freedom, a life without grace. Fortunately, through wise encouragement from older Christians and a good counselor, I was able to see the damage done by the Manipulator. The fear of coming across as prideful or arrogant is still there. The voice of the Manipulator still rings loud and clear. However, I don’t listen to that voice as much as I used to. I’ve realized that some of the things about me that were labeled “arrogant” and “prideful” are in fact gifts from God. Gifts to serve the Church, not sins to confess. I have found freedom. Manipulators tend to save this one for last. If they’ve tried everything else and are unable to manipulate the Target, they may simply accuse the Target of “having blind spots.” And if the target denies the existence of a particular blind spot, that’s taken as proof of its existence. This is the Manipulator’s perfect tool. Do we have blind spots, spiritually? Yup, probably. And could God use a Manipulator to reveal those blind spots? Maybe. But it seems that confronting blind spots is better done by a caring friend or a close confidant— not a Manipulator who uses the “doctrine” of blind spots as a last resort, with the end goal being control. Spiritual manipulators are angered and annoyed by people who aren’t easily manipulated. And although anger can be holy, it is one of the surest signs of a spiritual manipulator who’s out of a job. A spiritual manipulator who can’t manipulate is like a gun with a knot in the barrel. So be careful! Spiritual manipulation hurts and wounds—deeply. If you’ve been targeted, may God in his infinite mercy restore the damage done. May he provide deep peace and a safe shelter. May you see the character of his heart, washed clean of the manipulators who used God’s words to damage and control rather than to heal and set free. I originally published this article at Recovering Grace under the pseudonym Mark Andrews. It has been slightly edited for a broader audience. This is my story. I hope and pray that publishing this piece to a wider audience will help at least a few people recognize, heal from, and avoid, spiritual manipulators. Wow. An excellent overview dealing with a (sadly) too-common subject, concisely and well. Thank you for sharing this out of your own pain to spare others that same pain. You’re so right, Holly, this stuff is way too common. Thanks for stopping by, and thanks for the encouraging comment! Sounds like they are excuses for being less than we should be. It’s hard to be all that we should be in the Faith. The Bible calls us out for not being and acting as we should. Admonish one another in Love. Thanks for the comment, Deborah. I agree with you about the love part. : ) But that’s the problem; often, a manipulator throws around accusations like these, not because they love the Target and are trying to move them closer to Jesus, but because they’re threatened by the Target or they’re losing control of the Target. The aim is manipulation, and that’s nowhere close to love. Great article. Thank you. I was helped with this topic by reading a book called, IN SHEEP’S CLOTHING by George Simon. It was the most liberating and freeing information. He applies it to many walks of life. Thanks, Kathleen. I’ve heard a lot of good stuff about that book. Thanks for mentioning it here. I appreciate you taking up this topic. And yet you surprised me by not naming any of the tactics I would have. Yours are totally valid and relevant, but you obviously came from a different tradition than me. There are more! I’m sure I’ll take this further as I think about how to “name” things, but these rise up immediately. “The Lord told me….” “You need to support the leadership,” in reply to the expression of any concern or question. “You just have a personality problem,” in response to theological or policy concerns. “You need to stop being so negative.” And, biggest of all for me, the invitation to co-dependence. Thanks for your thoughtful sharing. There is a lot of value in the “naming,” as you say. That’s so true, Anna! Respecting God and the manipulator can become THE SAME THING. That’s kind of scary, but yeah, I’ve seen that happen too. Thanks for sharing! #2 could also be “slander”. Negative facts are often characterized as slander. After a testimony time at ladies retreat, the pastor’s wife made an announcement that these testimonies were not to be gossiped about. I was wishing she’d give us a definition of gossip so I could grasp how can repeating a testimonial be gossip? So apparently repeating praises about overcoming difficulties is also gossip. I noticed that the membership oath at a church I attended included a line that said “I will refrain from slander”. I wanted to go back and read that whole oath, so I picked up a membership application to see what the fine print said. It wasn’t listed on the application. Seems like that kind of binding agreement should be included somewhere on the application. “Negative facts are often characterized as slander.” Wow, that is completely true, and I have seen that many, many times. Thanks for adding that, and thanks for stopping by. I’m so glad you found this article helpful. May the Author of Peace continue to gently be with you as you journey with Him towards healing. — Jonathan T.
I remember I was in a car and the pastor started to yell at me, it went on for about 5 minutes. I realized he did this to most “new” people to control them and get them under his control. I committed to pray 1 hour before each service in the back for the Lord’s grace and healing over this minister. Within 2 weeks many problems came out and he left the city and the ministry. The Church went on and a young new pastor took over. I found out later that this pastor attempted to commit suicide and the rope broke (or that is what I heard). He was a man very much hurting on the inside and needed help himself. An abuser is always been abused either by circumstances of life or other great problems, though it is terrible to be on the receiving end of being hurt, if we can have the eyes of Jesus we can look past their 5 minute yelling as I did and in the end said, “thank you for saying these things can we pray now” and I ended up praying a blessing for the men, he was very shocked. It was hard but in the end it was the way of Christ to show love and mercy to the other brother. His struggles were far beyond what I could have thought. Thanks for your comment! I appreciate your thoughts, and I’m glad you were able to respond to the abuse in a Christlike way. In your example, the abusive behavior was pretty obvious and straightforward. Often, it is not. Additionally, it sounds like you were an adult when this event happened, while often times, abuse begins and continues throughout a person’s childhood. The situation is very different and must be acknowledged as such. In other words, the appropriate, Christ-like response might be different for a 5 year old than for a 25 year old. It gets dangerous when we start expecting abused children to respond like a mature Christian adult. I’m not saying that’s what you were recommending, I’m just offering some additional considerations. Thanks again for joining the discussion! Excellent article. This will help me in protecting myself and others who are attacked using spiritual terms. God bless you. Thanks for the encouragement! I’m so glad this article was a blessing to you. Excellent article. Been there, done that. My family and I were part of a church for 20 years that degraded into something reflecting the Discipleship Movement during the last 5 years we were there. Learned much. Since then, we have taken a fresh look at scripture and considered more of the example of Jesus we read in the Gospels. Glad this article was helpful. And you make a good point when you hint that a decent church/group can devolve into something not-so-healthy over time. Thanks for stopping by! I came back to re-read this. I read it back when you first published it. I had been accused of all four within that last week. I had been trying so hard to do better and seemed to be failing miserably. This gave me the words to help explain to trusted people what was so wrong. I’m in a healthier situation now. The lies are slowly being replaced with truth. Thank you. Wow, Emily! That’s so great to hear, although I’m sorry you had to deal with that in the first place. Thanks so much for sharing, and may the God of all Comfort continue to be with you and yours. — Jonathan T.
We’ve seen the accusation of “you’re not being loyal” used instead of the respect one used. Preached from the pulpit, used in training meetings, and used directly.